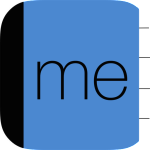 Me is a simple application which makes your personal contact information accessible in one click. To set it up, select your contact from your address book. Every subsequent time you launch Me, you will see your contact information. 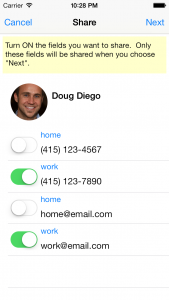 No more digging and fumbling through your phone to find your phone number. 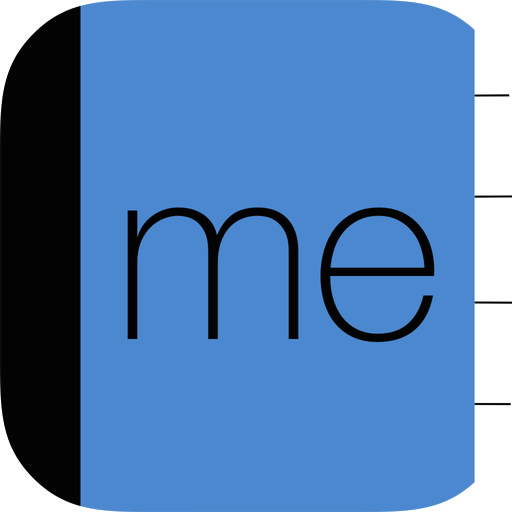 Me allows you to share your contact information as vCard. It allows you to choose which fields you want to share. For example you may want to share your work address, but not your home address. Now you can. But wait, there’s more! Send yourself emails as a reminder to do something with one click! Me makes this even easier. Just launch Me, click on your email address and you’ll be taken to the mail application with your email address pre-filled. Additionally, if you click on your address, you’ll be taken to the Maps application with your address location pre-filled. This is useful if you want to map directions from your house. Select a contact from your address book which represents you. 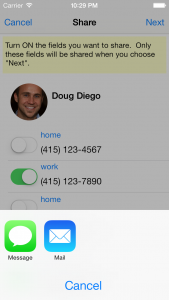 After setup, your contact is displayed on launch. Click on your email address to send yourself a quick note. Click on your address to put it on a map, to aid in mapping directions from your address. 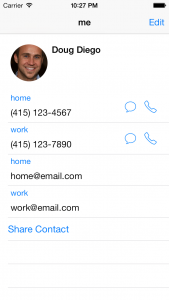 Added the ability to share your contact as vCard by allowing you to select exactly which fields to share. Added Address to your contact page. Clicking on your Address will put it on a map, to aid in mapping directions from your address.